Lot Detail - Disney 1940 Production Cel From Pinnochio -- Featuring Pinnochio as a Puppet & Figaro The Cat -- During The Scene When Geppetto Learns Pinnochio Talks! 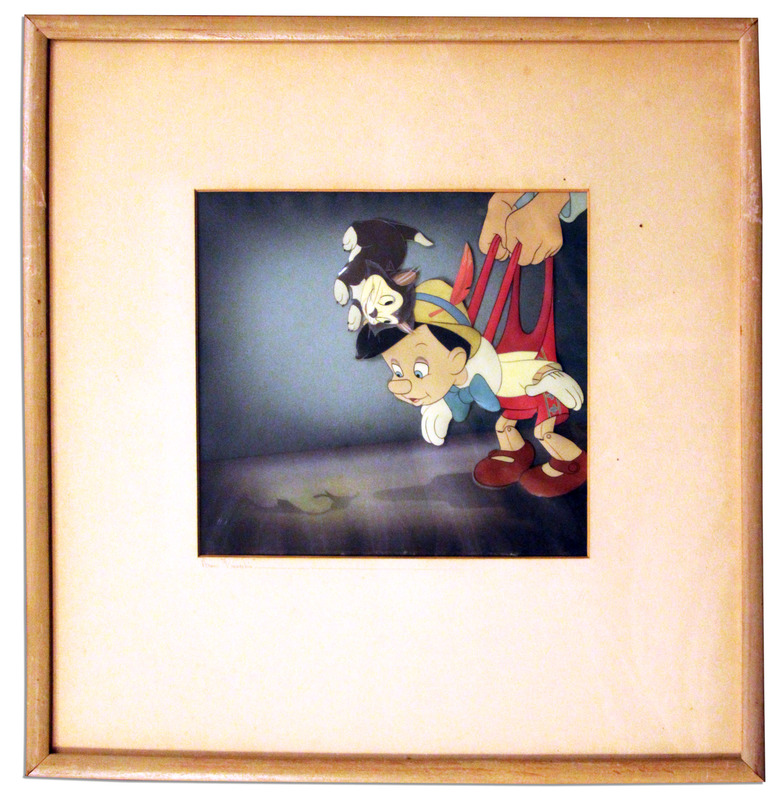 Disney 1940 Production Cel From Pinnochio -- Featuring Pinnochio as a Puppet & Figaro The Cat -- During The Scene When Geppetto Learns Pinnochio Talks! Cel from Walt Disney's ''Pinnochio''. Disney's second feature-length animated film in 1940 followed on the heels of the wildly successful and groundbreaking ''Snow White.'' Cel titled ''Pinocchio & The Cat'' was used in filming the thrilling scene when Pinnochio first speaks and woodcutter-turned-puppeteer Gepetto gleefully discovers his beloved creation has the potential to turn into a real human boy. Gepetto's hands hold Pinnochio up by his red suspenders while the cat, Figaro, watches in amusement. Both Pinnochio and Figaro were drawn by Disney staff animator Eric Larson of ''Disney's Nine Old Men'' core animation team. Measures 7.75'' x 7.25''. Matted and framed by Courvoisier Galleries to an overall size of 14.75'' x 15.5''. Figaro has shifted from original position and a pencil notation appears at the corner, else cel is near fine. Scratching to frame, else near fine. With original Disney label of authenticity affixed to verso of frame.